make a great after school snack. You can also make these appetizers ahead for a good night of card playing. They can be stored in the refrigerator up to 3 days in a tightly sealed container. Place strips in a shallow baking dish or resealable plastic bag. In a small bowl, whisk syrup, mustard, tarragon, salt and pepper until smooth. Pour into plastic bag on top of strips and marinate for 4 hours up to overnight in the refrigerator. When ready to serve, preheat oven to 450ºF. Thread strips on metal or water-soaked bamboo skewers. Simmer excess marinade in small sauce pan for 4 minutes. Keep hot. Arrange strips on a baking sheet lined with foil and bake for 15 minutes, basting with hot marinade a few times until cooked though and lightly golden. 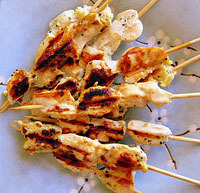 Arrange on serving plate and drizzle remaining hot marinade over the strips.